As The Total Bent charts a musician's arc, we're presented with an exploration of the intersection of religion, politics, and art. One never existed without the other; any revolution in one was fomented by the others. Political revolutions were/are almost always in response to religiosity, and they've been spurred, bolstered, defeated, crystallized, or in some other way represented by art. If you know me, you know these themes resonate with me. The show, however, didn't quite work. The incredible original musical, Dear Evan Hansen, will bow on Broadway beginning this November. (The musical, which had a run in DC, is finishing its sold-out, extended run at off-Broadway's Second Stage this week.) 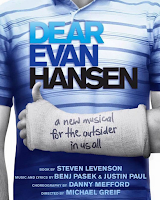 Written by Benj Pasek+ Justin Paul (score) and Steven Levenson (book), Dear Evan Hansen conveys what it's like to be teenager now, what it's like to have more opportunities for connection than ever before but still feel lonely. Star Ben Platt gives a deeply affecting performance. No official word on casting, though I can't imagine Platt (and Rachel Bay Jones, playing Evan's mother) wouldn't be asked to make the transfer. A theatre and exact dates have not been announced, but you can visit dearevanhansen.com to sign up for updates. Friend art, according to a faux dictionary definition emblazoned on the wall of Second Stage's uptown theatre, is "art a friend makes that a person is forced to go see and/or support out of obligation to the friendship." 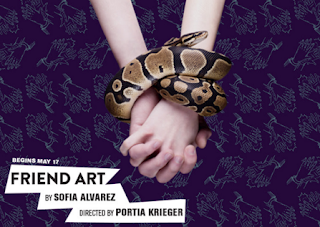 With Friend Art, playwright Sofia Alvarez explores the challenges and opportunities inherent in friend art. Sitting through Friend Art (and then reading Alvarez's bio), you get the sense that this is a personal play for her. Perhaps she's been the friend creating "art"; maybe she's been the friend who has had to go see such "art"; or maybe she's been both. For my final ballet outing of NYCB's spring season, I attended a 21st century choreographers program. First up was a repeat viewing of Justin Peck's Belles-Lettres, a chamber piece (of sorts) that premiered at the 2014 Fall Gala. (I saw it a couple of weeks later.) Featuring nine dancers, including the newly minted principal Taylor Stanley, Belles-Lettres plays with shapes and formations, and the way things look from different angles. (I can imagine Peck thinking about how the choreography looks from the orchestra as compared to how it looks from the fourth ring—a head on view compared to a bird's eye view.) It's a pretty ballet, with nice moments for each of the four couples (Kristin Segin and Jared Angle; Indiana Woodward and Adrian Danchig-Waring; Brittany Pollack and Stanley; and Rebecca Krohn and Tyler Angle), and a well-integrated creator/tinkerer in Anthony Huxley. Though Paula Vogel's Indecent is a new play and tells a story I didn't know, it reminded me of stories I've heard before. 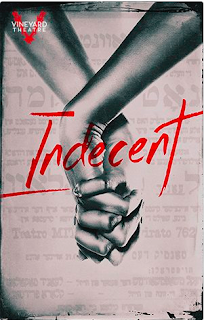 With the subtitle, "the true story about a little Jewish play," Indecent tells the tale of Sholem Asch's play, God of Vengeance. In the early 1900s, Asch was a Polish Jew and a writer. Shortly after getting married, he wrote "a little Jewish play," and tried to get it produced. The trouble was that the little Jewish play depicted Jews as—shonda alert—actual, flawed human beings, humans with desires, and, ahead of its time, lesbian characters. At first, power players in the Yiddish theatre scene were wary of producing God of Vengeance, afraid of how it portrayed Jews. Asch challenged, "Why does every Jew on stage have to be a paragon?" Why can't Jews on stage, he argued, represent the full complement of Jews in real life? The power players were unmoved. 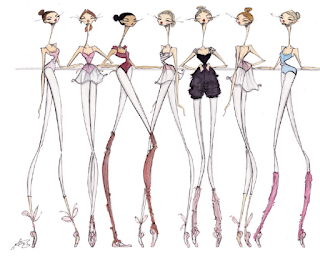 NYCB's spring season continues. Saturday afternoon's program was All Robbins, featuring Dances at a Gathering and West Side Story Suite, two ballets I thrill over each time. The last time I saw Dances at a Gathering in full was January 2011 (an excerpt was presented during Wendy Whelan's farewell performance in October 2014), so while it felt familiar, it also felt fresh and new. I don't typically include artists' personal or lifecycle event information in these posts, but I'm making an exception. Shuffle Along... leading lady, Audra McDonald, and her husband, Will Swenson, are expecting a child! (Both actors have a child/children from their respective previous marriages.) Of course, this means that a casting shuffle is due at Shuffle Along... The pregnant McDonald will continue with the show through July 24 before going on maternity leave; she intends to return to the show this winter. (This also means that the Lady Day... West End production is postponed. Broadway.com has more about that.) Filling McDonald's tap shoes will be Rhiannon Giddens, making her Broadway debut. In addition, over the summer, the show's Tony-nominated choreographer, Savion Glover, will appear in the show, though, as Broadway.com reports, it has not been announced which track he'll take on. Congratulations to McDonald and Swenson!! !